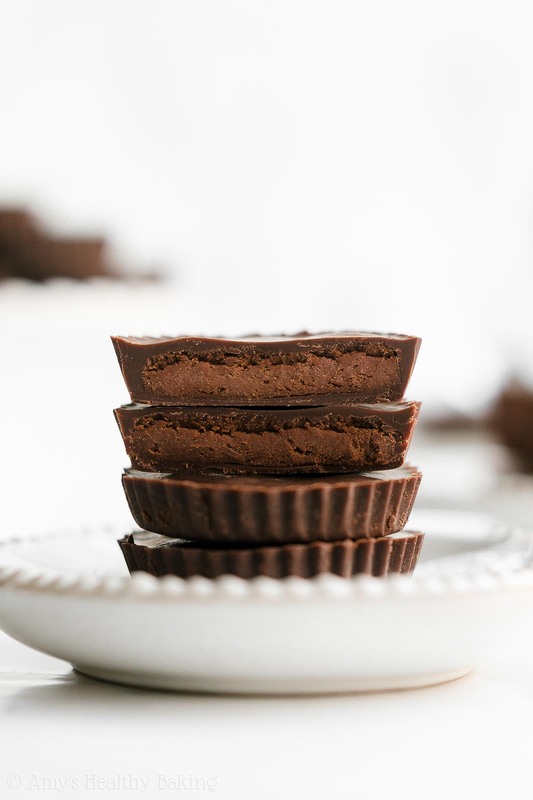 Learn how to make these healthy homemade peanut butter cups from scratch! Only 38 calories! They have a dark chocolate coating and a dark chocolate peanut butter filling—but no butter, oil, heavy cream or added sugar! Towards the end of December, I stopped by the bank to deposit a check after a marathon session of running errands and Christmas gift shopping. When I handed the bank teller my check, she looked down at it, back at me, and apologized profusely because she didn’t have the authority to take care of something from that particular sender. She explained that her manager would be able to complete the deposit after finishing with another customer, and I reassured her that wasn’t a problem at all. We chatted for a few minutes, until a new patron walked into the bank, and I offered to step aside to let the sweet teller help him. After the man finished his transaction, I talked with the teller for another couple of minutes, but when I remembered the dark chocolate bars sitting in my car in the hot Southern California afternoon sun, I mentioned to her that I needed to rescue the chocolate from my car before it melted. She smiled, and when I walked back into the bank with the bars tucked safely inside of my oversized purse, she asked me if I wanted some of their chocolate. Upon seeing my puzzled face, she grabbed a gigantic golden box, walked around the counter, and opened it to show me. Inside sat a few dozen gourmet truffles from See’s Candy, and she insisted that I took one. When the manager finally finished with her customer, she led me over to her desk to complete the deposit for my check. Just like the teller, she apologized over and over again for making me wait, and when she handed me the receipt for my transaction, she also brought out another dark chocolate truffle from the golden See’s box for me to enjoy on the drive home. I love the ladies who run my local bank! 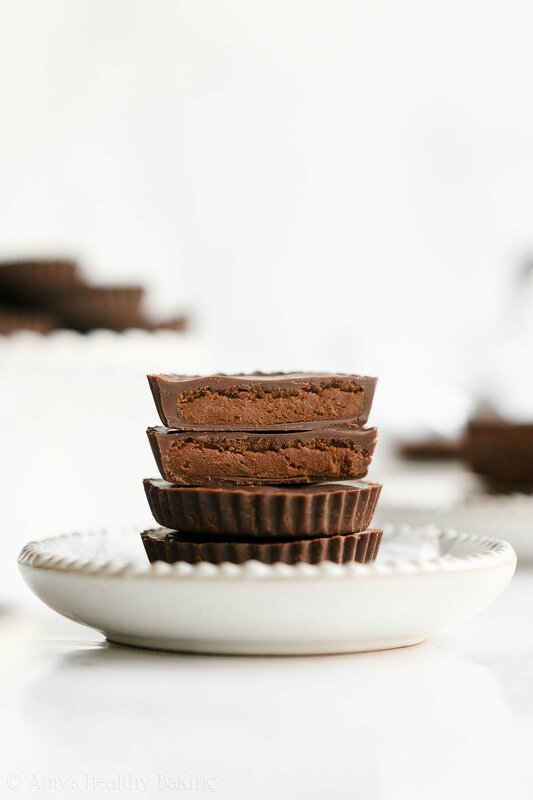 And those same sweet ladies were the inspiration for these Healthy Double Dark Chocolate Peanut Butter Cups! These are incredibly rich with a silky smooth dark chocolate coating and a decadent dark chocolate peanut butter filling. Yes, dark chocolate flavors in the filling too! 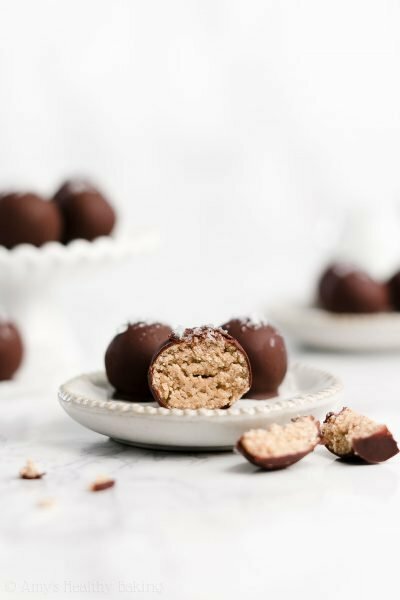 Yet unlike the See’s truffles inside of that big golden box, this healthy homemade candy contains no butter, oil, heavy cream, artificial flavors, refined flour or added sugar. And they’re just 38 calories! 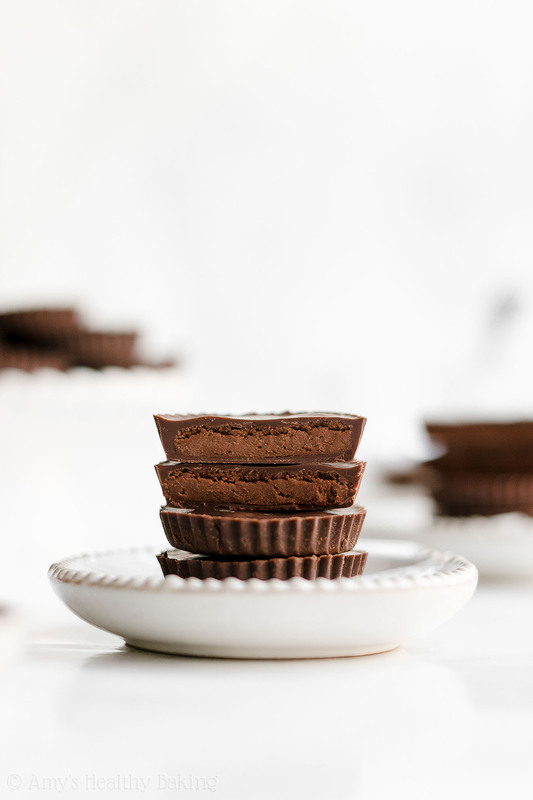 Let’s go over how to make these healthy double dark chocolate peanut butter cups! Tip: This recipe is fairly simple and straightforward, yet it does take a while to assemble all of the peanut butter cups. I like to play a baseball game or podcast in the background while I’m working. It makes the time fly by much faster! 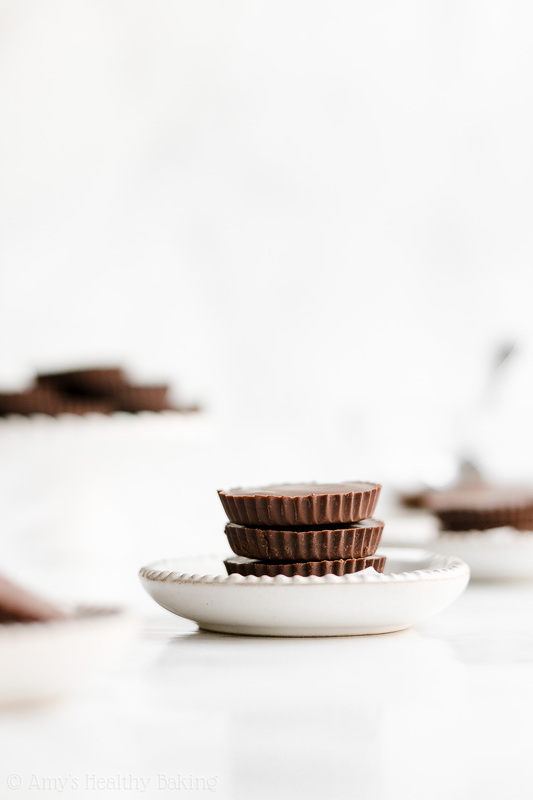 You’ll start by making the filling for your healthy double dark chocolate peanut butter cups, which requires both peanut flour and unsweetened cocoa powder. I highly recommend using the regular kind of unsweetened cocoa powder, like this, rather than the Dutched or “special dark” versions. 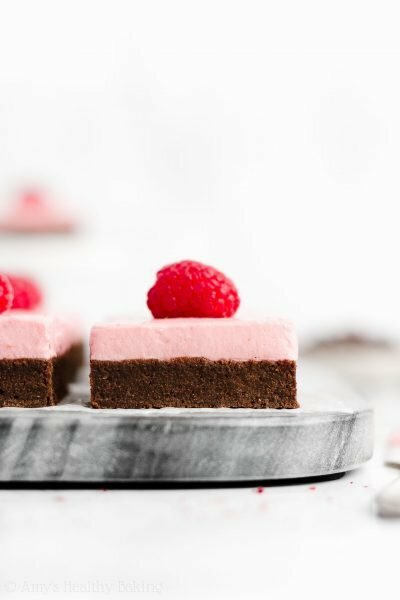 The regular unsweetened cocoa powder has a stronger and richer flavor in this recipe, which makes the filling taste so much better! As for the peanut flour, it’s made by finely grinding partially defatted peanuts, so it just has that one ingredient—peanuts! Because of the process to make it, peanut flour has a more powdery consistency than almond flour, as well as twice the protein and half the fat. How cool is that?? I actually buy mine online here! 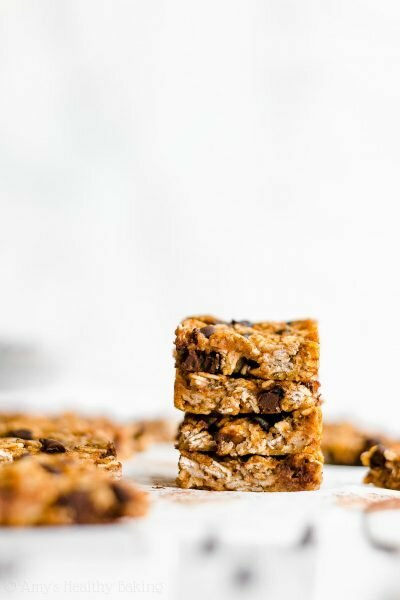 Tip: I’ve found that almond flour doesn’t have nearly as strong of a flavor as peanut flour, so I don’t really recommend substituting it in the filling. You’ll also whisk in a little salt (or a lot, if you’re like me!) before stirring in water and sweetener. I used liquid stevia to sweeten the filling. Stevia is a plant-based, no-calorie sweetener that contains nothing refined or artificial (aka it’s clean eating friendly!). It’s also highly concentrated. You just need ¼ teaspoon, which is the equivalent of about 2 tablespoons of sugar! Time to shape the filling! You’ll roll it into 24 small spheres and then flatten each one to look like a disc. You want each filling disc’s diameter to be just a tiny bit smaller than the diameter of a mini muffin liner. 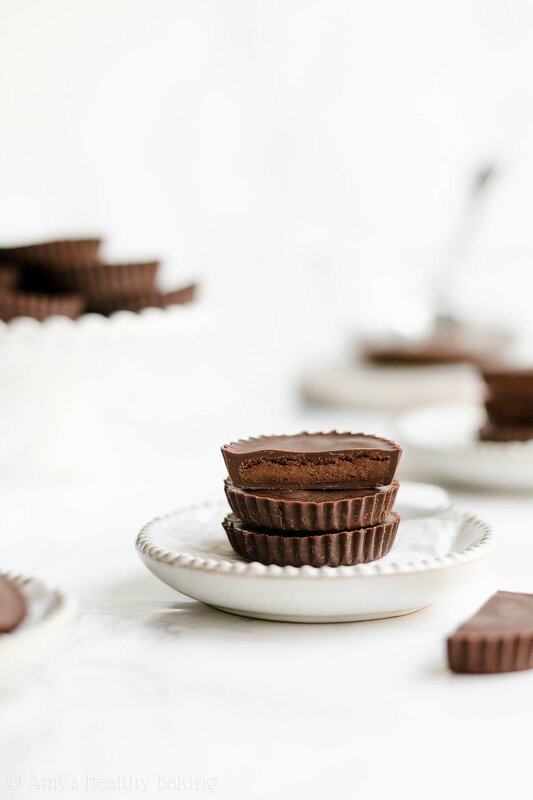 This ensures that the filling will be entirely covered by the melted chocolate in each of your healthy double dark chocolate peanut butter cups! Tip: You must flatten each filling sphere to be a disc. This is incredibly important! 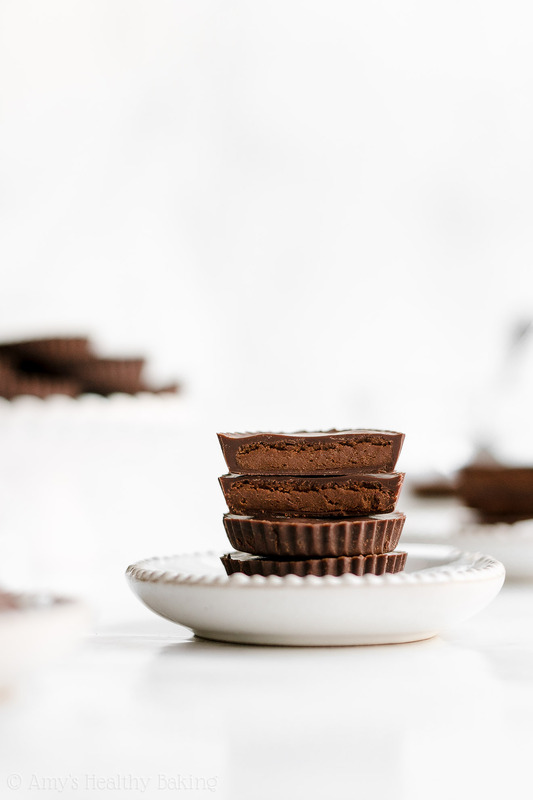 Think about it… The tops of your healthy double dark chocolate peanut butter cups are flat, right? Not round or domed. Therefore, the tops of your filling should be flat too! 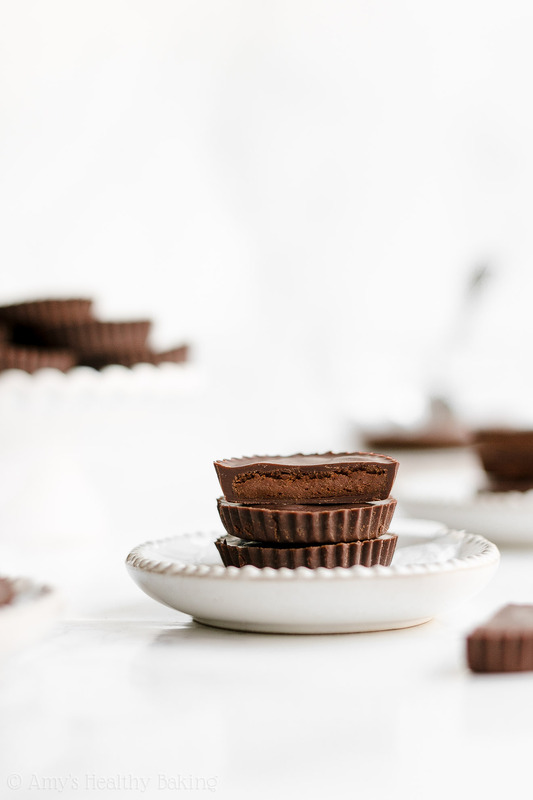 Otherwise, the round ball of filling will poke up out of the center of your healthy double dark chocolate peanut butter cups. Not good. ? So take the extra 3 seconds to flatten each one of your filling spheres! Once your filling is shaped, it’s time to melt chocolate! I highly recommend using good quality bars of chocolate, like this kind from Ghirardelli or this kind from Lindt. Do NOT use chocolate chips! 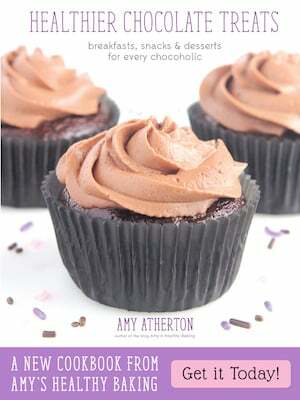 Chocolate chips contain a stabilizer that prevents them from properly melting. I’ve also found that Hershey’s special dark chocolate bars and Cadbury dark chocolate bars don’t melt as well either. They’re much thicker when melted, compared to the almost liquidy melted chocolate from Ghirardelli and Lindt. And the liquidy texture of those latter two is much easier to work with! A metal panini press! Probably not what you expected, right? ? I plug in my metal panini press (mine is no longer sold in stores, but this one is similar! ), and I place a folded washcloth on its metal top. Then I put my bowl of melted chocolate on top of the washcloth. The heat from the metal top keeps your melted chocolate warm throughout the entire process of making your peanut butter cups. When melted chocolate cools, it’s harder to spread, and you end up with freckled or speckled peanut butter cups, especially when you have to reheat it as it cools. 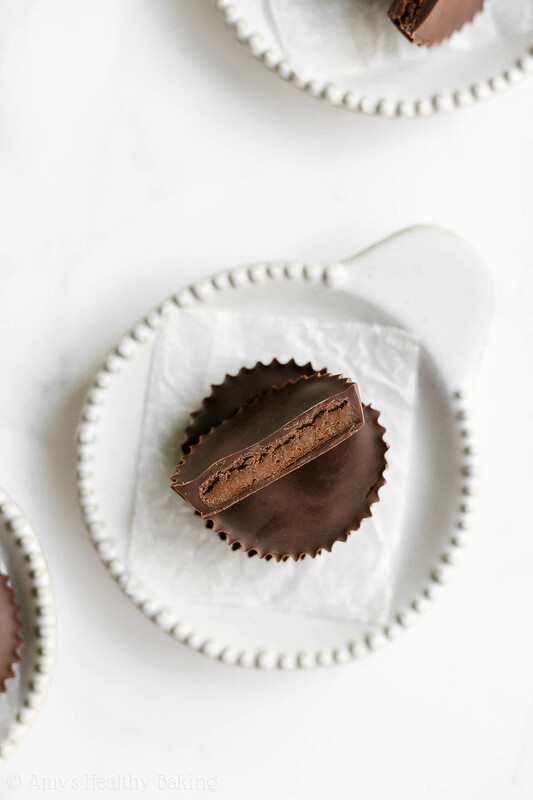 So by keeping the melted chocolate warm, you end up with silky smooth and beautiful healthy homemade double dark chocolate peanut butter cups! Tip: An electric pancake griddle would also work instead of the metal top of a panini press! The actual assembly process is really easy! 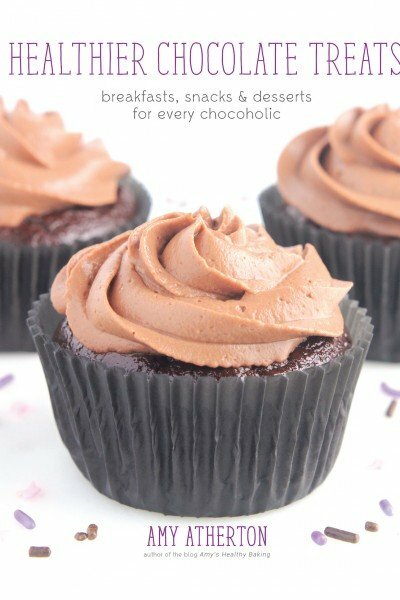 Working with one or two mini muffin liners at a time, spoon in a small dollop of melted chocolate, just enough to barely coat the bottom. Lay a flattened filling disc on top, and spoon a little more melted chocolate over it. Use your spoon to spread the melted chocolate down past the sides of the filling disc. Then keep going until you run out of filling discs and melted chocolate! Then enjoy your delicious healthy homemade candy! And when you make your own, remember to snap a picture and share it on Instagram using #amyshealthybaking and tagging @amyshealthybaking IN the photo itself! (That guarantees I’ll see your picture! ?) 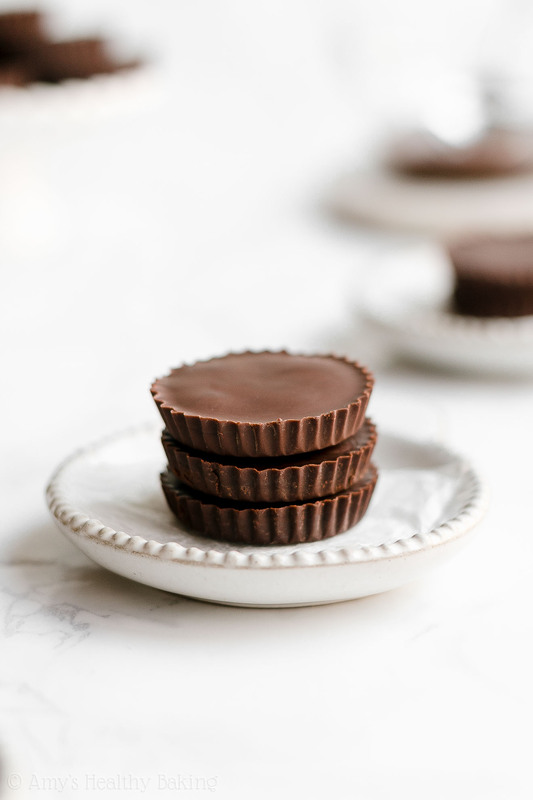 I’d love to see your healthy homemade double dark chocolate peanut butter cups! These healthy homemade candies are perfect for chocoholics! A silky smooth dark chocolate coating surrounds the rich dark chocolate peanut butter filling. Sprinkle the tops with a little flaky sea salt for a fancy finishing touch! Leftovers will keep for at least one week (if not longer!) if stored in an airtight container in the refrigerator, and they also freeze really well. In a small bowl, whisk together the peanut flour, cocoa powder, and salt until thoroughly combined. Stir in the water and liquid stevia. Notes: I highly recommend this peanut flour! (← I buy it online there!) It only contains one ingredient (peanuts), unlike many others that contain added sugar or other ingredients. I have not tried with PB2, PBfit, etc. I do not know how those other types will work. I prefer my peanut butter filling on the salty side, so I usually increase the salt by an additional ¼ teaspoon (for a total of close to ¾ teaspoon salt)! For sweeter filling, increase the liquid stevia by an additional ¼ teaspoon (for ½ teaspoon total). I buy my liquid stevia online here, and you’ll use it in all of these recipes of mine, too! 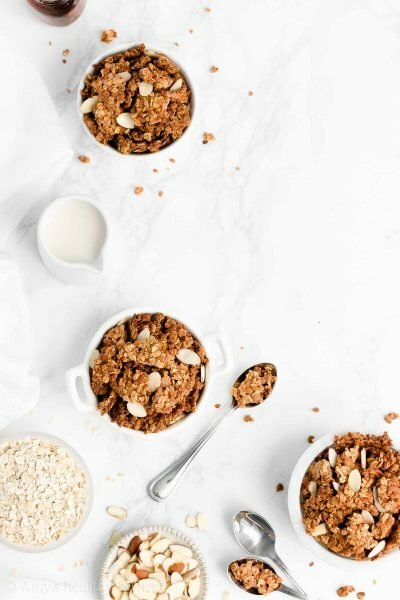 If you prefer not to use the liquid stevia, then substitute 2 tablespoons (30mL) of pure maple syrup, honey, or agave, and reduce the water to 1 tablespoon + 2 teaspoons (25mL) instead. 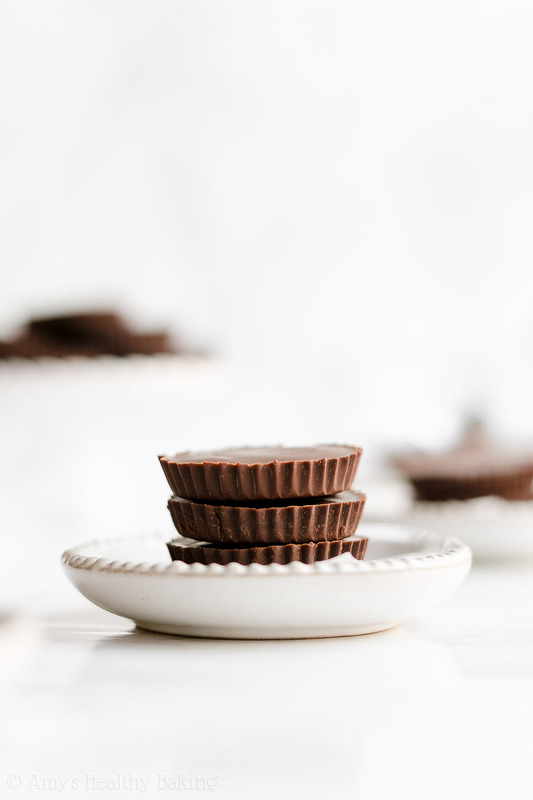 Flattening the filling into discs ensures the tops of your PB cups are smooth and flat too, not rounded from the sphere poking up out of the chocolate! For more tips and information, please see my blog post above! I love reese’s peanut butter cups, but I know they are just so bad for me. I’ll be sure to try this recipe when I get some time, they look sooo good! Thanks for sharing!